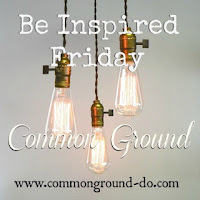 I really enjoy dreaming up clever outdoor vignettes re-using second hand, vintage junk that I can find inexpensively. I hope you enjoy seeing them! In this post, I will be revisiting three garden vignettes to show their progress this summer season. Garden Junk Vignette - Iron, ironing board. clothespin bag. There was "Pressing Garden Matters" that debuted in late May here. Now in late July, the Rose Star Calibrachoa in the "laundry basket" has filled out nicely. I still love that little homemade clothespin bag. And here's "Another Kitchen Fairy Garden" posted in late May. You can look back at the original post here. Since then the hen and chicks, sedums and herbs have filled in nicely and the herbs have even been trimmed up. The rusty iron fairy is kneeling on the aluminum star jello-mold path, in front of her Rumford Baking Powder tin house, with enamelware funnel corked roof. The hens are having plenty of chicks in the vintage ice cube tray. Also baby chicks in the measuring cups. A butter knife fence is in the foreground. Oregano, thyme, rosemary, sedums, and hen and chicks. Then in June, I posted photos of my chippy white wheelbarrow in a "Laundry Themed" vignette, showing off my recent vintage wringer find, and a planted laundry stomper. The red, purple and yellow calibrachoa in the front laundry tub and the mixed nicotiana in the back tub were just starting to fill in here. Alyssum are planted in the upside down stomper. 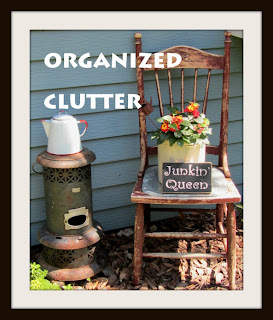 I hope you enjoyed taking a second look at these garden junk vignettes! I need your garden fairy to cast a spell on my flowers! I love the clothespin holder, too. I actually hang bedding out to dry, so I need to find myself one. Your flowers are amazing. I love the laundry basket filled with the bright pink flowers! Oh, so great to see how well your vignettes have progressed. Thanks for the update! I love that you show the progress of your beautiful gardens. That kitchen fairy garden is still my all time favorite! So glad you did an update of your vignettes. The fairy kitchen garden is still my favorite. Love the ice tray garden. 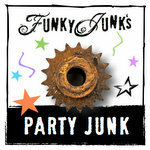 Isn't it amazing how junk can enrich your life? Carlene, I love your vignettes and everything has filled in so nicely. I must have missed the Sedum kitchen garden in the half barrel, love it! I just found an old large funnel and planted and old sink with some Fall color. It's the sink I found when picking a barn a couple years ago. I thought I would use it in the farmhouse kitchen. Our contractor talked me out of it. Saving it for my potting shed, but why not plant it and let it be fun outdoors for a while. Thanks for sharing with SYC. p.s. I bet the ladies loved your garden tour!